HoneyBaked Ham IT executive Bill Bolton outlines role of IT and six steps for prioritizing the project pipeline. 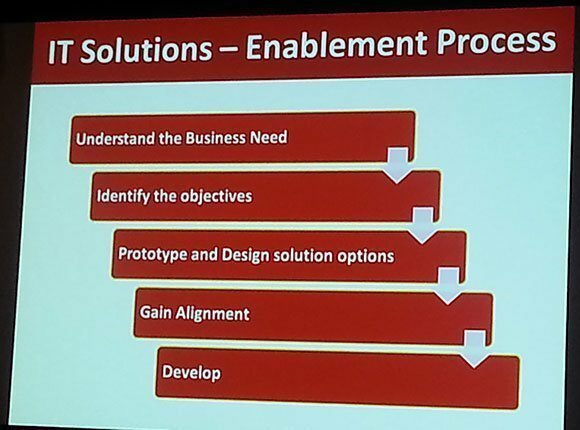 At this year's Kodak Alaris Global Directions 2013 conference, Bill Bolton, vice president of IT at The HoneyBaked Ham Co., delved into the role of IT and six steps for prioritizing the project pipeline. Along with Mark O'Brien, vice president of marketing at HoneyBaked, the two stressed the importance of having an enterprise partnership between the IT and marketing departments when making IT decisions, and provided actionable steps to rethink the project selection and implementation process. 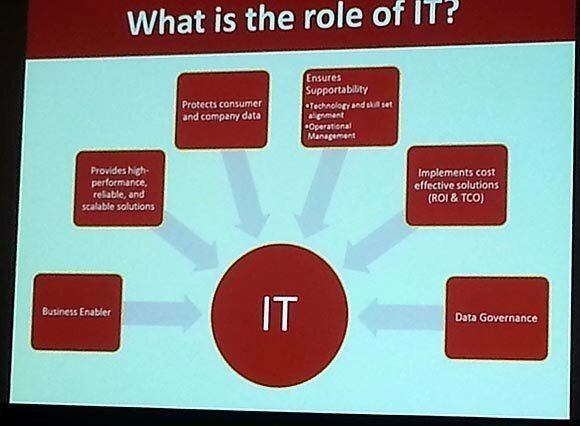 What is the role of IT? Business enabler: Promoting agile development and work flexibly to meet the goals of the organization. Solutions enabler: Providing high performing, reliable, scalable solutions. Payment Card Industry compliance provider: Securing consumer and employee data across all channels. Supportability ensurer: Ensuring alignment between the organization's goals and IT staff. Providing assurance that the talent can support and manage apps, data and both new and existing IT initiatives. Technology implementer: Deploying cost-effective solutions with a measurable ROI. Data governance manager: Providing data governance and governance platforms, a key element for assessing if transactions are valuable, as niche departmental vertical reports are difficult to manage without a strong data governance framework. How will they access it? How can we secure it? How can we deliver it? What is the IT solutions selection process? Identify business owner of project. Identify stakeholders affected by project. Develop business case: What are we trying to accomplish, who needs to be involved and what resources are needed to enable the project? How will this meet our long-term goal of increased business success? Schedule project and determine resource allocation. What comes after project selection? If the project selection process is performed correctly, there shouldn't be what HoneyBaked refers to as gaps to address in the enablement phase -- holes that can be filled with a supplemental initiative or areas where a current business need has not been met by a current project. That said, if a smaller, still-important project that requires fewer resources comes to light, HoneyBaked has a way to address these "gap fillers." O'Brien stressed that it's key to have a place where employees' needs can be heard via a "gap survey." This allows for smaller-but-critical initiatives to get their time in the sun for consideration and potential implementation.